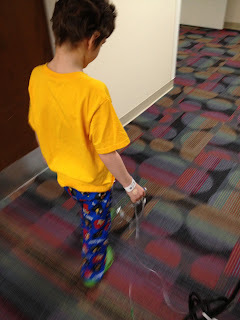 Since Sam wasn't yet on any meds, it was a pretty quiet night. Shocking, right? Who sleeps well in the hospital? Well, we did. Thank goodness. I'm such a mean mom. I made him walk there. He only stopped to rest 4 or 5 times. You have to remember how to hold onto your lines and avoid stepping on them. These are things you never wanted to have to remember. 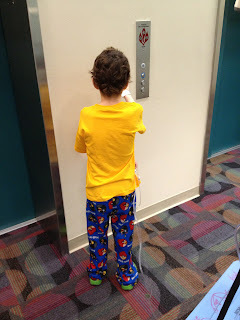 Either way, it got him moving, and we played a rousing game of Hide-and-Find (with stuffed germs) after we returned to our room. 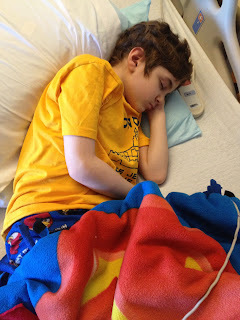 Chemo started in the afternoon and it wiped Sam out. But it's only for the 8 days of chemotherapy. So we can make this work. 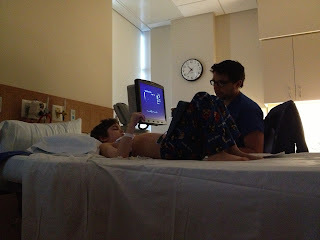 A little fever at the end of the night got Sam his first dose of IV antibiotics and we're hoping for another quiet night. What are the odds of two in a row? Sam- only you could still look so darn handsome even after chemo. Hang in there kid! I bet this new drug is gonna beat up on the bad stuff and kick it right out of your body. Most young'uns would be thrilled not to have to eat leafy greens....embrace the good news & set the bad free.